Is a Unified Airline Pilot Training Center the Answer to the Pilot Shortage? In 2012, on my first visit to the EU, we stopped over in Frankfurt, Germany for a RON as we traveled to Salzburg, Austria. After we boarded a shuttle bus and departed FRA for our hotel, the first thing we drove past was a gigantic complex of buildings, modernistic in design and hard to miss. What got me interested was the Lufthansa Airlines logos all over these buildings. I had to know more. Our shuttle driver was more than happy to share: “That’s Lufthansa’s Pilot Training Center,” he said, “because they train all their own pilots there.” Now I really had to know more. Since January of 2017, all of the Lufthansa Group’s flight schools have been united under the brand European Flight Academy. As such, the previous training centers operated by Lufthansa Flight Training, Swiss Aviation Training, Pilot Training Network, the Bremen Commercial Flight School, and the Airline Training Center Arizona have joined forces and support you on your path into the cockpit of a Lufthansa Group airline or another European airline. With over 50 training planes and state-of-the-art simulators at a variety of locations in Germany, Switzerland, and the United States, we offer you the best prospects for a career as a pilot at a Lufthansa Group airline or another well-known airline. “I don’t know why the U.S. airlines don’t just train their own pilots like Lufthansa does,” she said. We both sat kind of stunned for a moment contemplating the thought of that, when she continued. 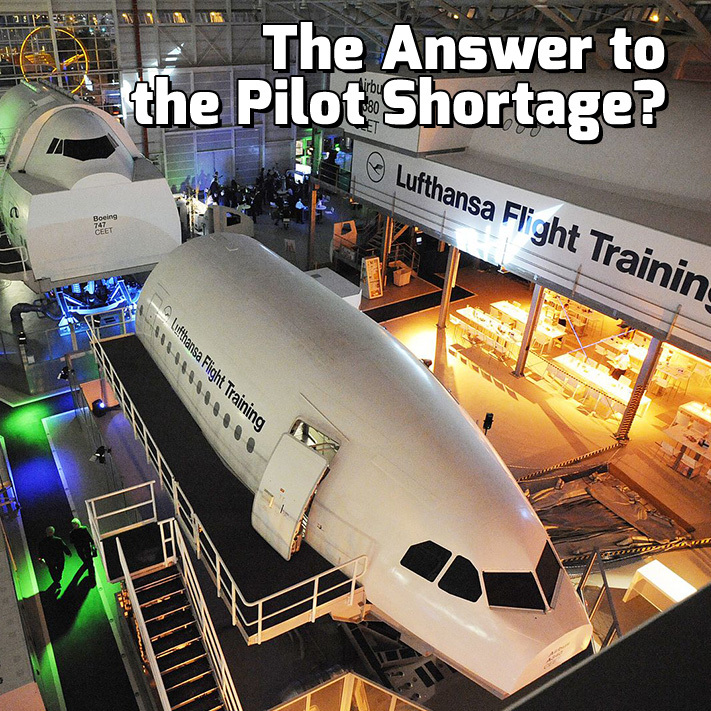 “The U.S. airlines should all get together and build a training facility like Lufthansa’s in Frankfurt, and just train their own pilots and eliminate these crew shortages.” I knew my wife was brilliant, but the more we discussed this, the better I liked the idea. What if the all the legacy and regional airlines put their money together and built one gigantic training center, and started cranking out skilled pilots that fly in “airline mode” from day one? Sure, the idea could have negative impacts on flight schools, CFIs and the collegiate training system, unless these players could be brought into the program to provide the actual training. Imagine an eager young man or woman with eyes on the sky being able to spend maybe six months in a nice dry climate with plenty of “clear and a million” flying days, coming there with zero time and leaving with a First Officer’s position for a regional airline. At no cost to the student…none, zippo, nada. The airlines need pilots in a bad way, and the problem is only getting worse. By pooling their money and resources at this new U.S. Pilot Training Center, costs to train each new pilot go down dramatically. And at this center would be everything a student needs to live comfortably throughout their training, dorms, restaurants, open green space, and since they are of the age where this really matters, easy transportation to the nearest night life. But the focus of the student’s stay at this new airline-controlled training center would be to learn to fly airliners. Nothing else would be taught, and it would not be a degree program in the common way we think about college degrees. Every credit these students earned would be laser focused on one thing: Flying airliners. It could be commonly agreed by the participating airlines that once a student completes the training, there would be a guaranteed job waiting as long as they meet FAA requirements, whatever those look like at the time. Will this ever happen? I seriously doubt it. But if the sector ever gets to a point where the majors are cancelling flights like some regionals are doing now, they may have no choice but to do something drastic like this. Right now, it can cost north of a quarter million dollars to get airline qualified at the major aeronautical universities, to take a job paying salaries that, while recently increasing, are still pretty paltry compared to what bright young MBAs earn in their first gig out of college. This was a brilliant concept hatched by my wife, and we are both sure the idea probably has been discussed before in airline Board rooms. Nothing like this exists currently – with all airlines teaming up to train their own pilots – so those Boards must have concluded that working with their competition on anything is just not going to happen. But if we ever start seeing United, Delta, American, Southwest and JetBlue park their planes because nobody is available to fly them, I have a hunch those same Board members might have something to discuss.